My friends think that I am weird. There is no TV in our house. Technically we have no TV services. My husband and I are in agreement that we can survive with one less thing at home in this technology abundant environment. One lazy summer afternoon, my kids and I were desperately looking for things to entertain ourselves with. Then, a dusty chess set caught my eyes. Ever since that day, my home has been filled with never-ending drama as well as valuable lessons during chess playing. Clients seek me out to help their children from elementary to high school sustain their focus, plan ahead with their school work, and persevere through a stressful academic term. As an educational therapist and coach who teaches students executive functioning skills in my office, I find a parallel between the long term projects that we do in my sessions and the chess battles at home. 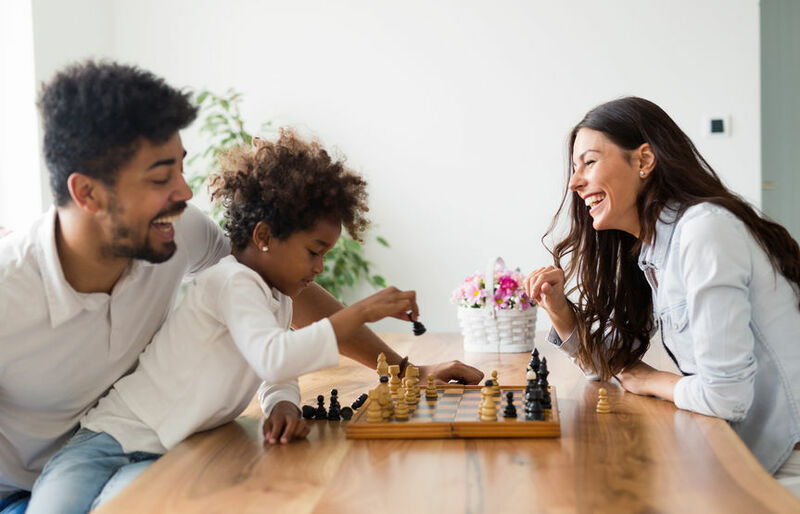 Here are 10 opportunities to strengthen executive functioning skills when parents play chess with their kids at home. 1. Sustaining Attention: It is not hard to focus for hours playing video games or watching our favorite shows. Can your child focus and sustain the same stamina for a period of time without electronic devices? Honestly, my attention seems to get shorter and shorter with constant buzzings and reminders. But I love the sensation that everything seems to pause when I am in chess battles with my sons. Do you desire your kids to work out their attention and stamina muscles the old-fashioned way? 2. Emotional Regulations: Chess games come with a whole spectrum of emotions from ecstasy, disappointment, surprise, hopelessness, to distress. These raw emotions provide wonderful opportunities to identify and talk about. 3. Safe Failures: I like to remind kids at the beginning of each game. “Sometimes we win. Sometimes we learn.” Losing is hard for everyone whether young or old. The more we expose our kids to safe failures, the more immune they will get to the inevitable reality of not always getting preferred outcomes. 4. Working Memory: It is defined as temporary memory that one needs to manipulate to accomplish a goal while accessing long-term memory. Can they remember how each piece moves while recalling their next two or three moves? Only time will tell, but kids seem to have an advantage over parents in this area. 5. Response Inhibition: Inability to control impulses is one of the hallmarks of ADD/ADHD. If they tend to eat up little players such as pawns at the expense of big players like rooks because they forget to check the surrounding, this is definitely an area for more practice. 6. Time Management: Personally my least favorite part of chess is the waiting part. Sometimes one minute can feel like an eternity. How much time is considered as courtesy wait time? 7. Error Analysis: One day, my son who was watching me playing chess with his brother in the background made an unexpected remark after I lost the game. “Mom, can I show you where you made the critical mistake earlier?” Chess games can sharpen error analysis skills especially if you are a silent spectator. 8. Cognitive Flexibility: Doesn’t life always throw curve balls? Cognitive flexibility is a key ingredient when we need to set aside our grand strategies and respond to opponents’ moves that are not a part of our plan. If your child tends to go through routines, have fun shaking him up. 9. Perspective Taking: Some days my little guy would go into meltdown mode after a surprise attack. No amount of hugging, empathy, or taking a break would do any good for his self-esteem. Then I suggest swapping our places in the game. This can create chaos in my already cluttered brain. It is worth getting the smiles when they find out their destiny has been turned around. 10. Resiliency: In some ways, losing your queen feels more devastating than getting checkmated. Do you want to foster grit in your child? Model a never give up attitude even if you lost your most valuable piece. Chess battles with your kids are a win-win opportunity. If you win, you have a sensation of victory. Even if you lose to your kids, the rewards are great to know that your kids are gaining skills and even surpassing you. So, consider this, why not put aside your devices this weekend, try a game of chess and teach your kids some life skills? Deanna Kim is an Educational Therapist specializing in academic coaching and math interventions at Summit Center in Walnut Creek. Deanna currently offers math support to students using Making Math Real methodology, as well as coaching for executive functioning. To make an appointment with Deanna for your child, call (925) 939-7500 or email info@summitcenter.us.